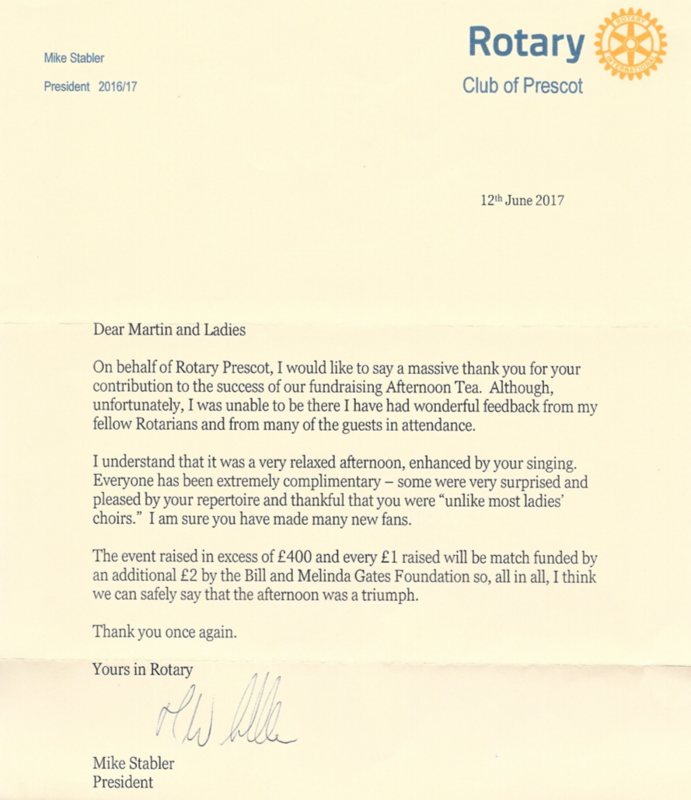 Letter of appreciation 'singing' the praises of Rainford Ladies' Choir's performance on 11th June 2017. ​The choir was performing at Grange Golf Club, St Helens, for the charity 'Purple4Polio'. ​We were delighted to be part of such a worthy cause and enjoyed the welcome given to us by the audience. ​Raising monies for charity continues to be a driving force for the choir. ​What a great fund raising event: Rainford Ladies' Choir raised over £344 for a breast cancer charity. The event was part of Wendy's (of Wendy's Flowers Rainford) 'Turn Rainford Pink' event. 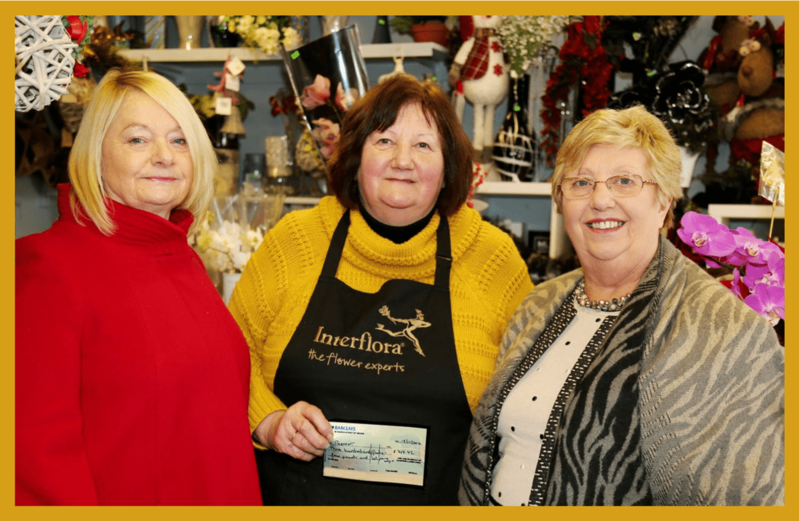 Kathy Hill and Helen Molyneux pass the cheque to Wendy, the day after the sell out Christmas concert. October 2015 - 'Why We Sing' at Rainford Parish Hall with guest soloist Tom Loughlin (tenor). 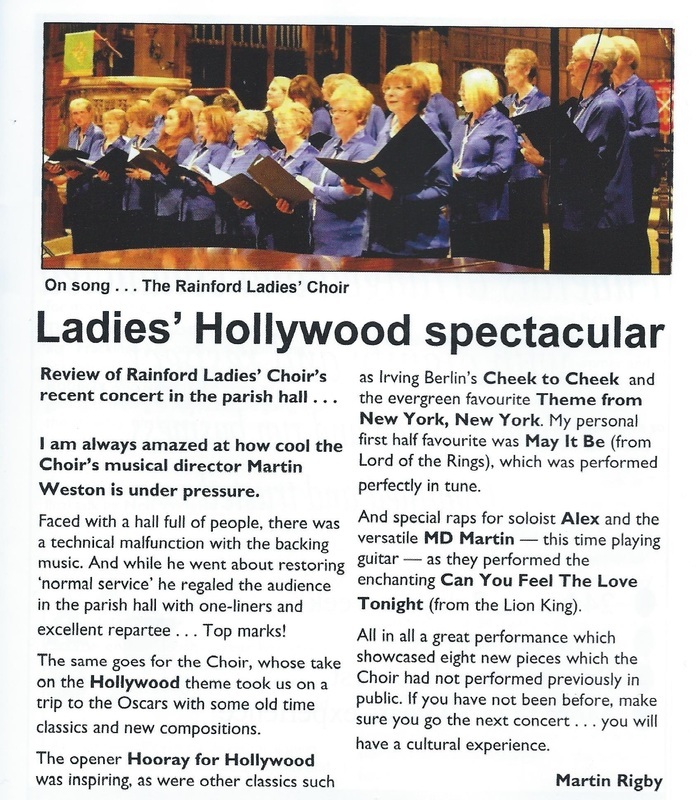 A review of our recent 'Hollywood' concert (May 2016). 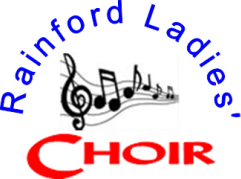 THEIR name is a bit of a mouthful - the Rainford Ladies Ecumenical Choir - but their 30 combined voices can lift you with sheer bliss. And it was to a house-full attendance that the girls presented their Spring Songtime (in unexpected summer-like evening heat!) to raise funds for the village walking day. The choir attraction proved so popular that the show, in the parish hall, was sold out even before admission tickets were printed! Parents, friends and musical admirers piled in from many towns around - even including the Wirral. And the man the all-female singers look up to is musical genius Martin Weston, an accomplished pianist and a former head singer with the Westminster Abbey choristers, who deftly conducted the programme, and later did a solo spot, with keyboard and voice, harking back to the 1970s-80s. Even his mother, Maureen, a member of the choir, had to follow Martin's spot-on conducting role. The show programme was a delight for lovers of big shows and of George Gershwin, with some appealing solos and duets. Solos came from Gillian Waywell, Patricia Forber, Jackie Keogh and Linda Hunter, with duets from Jennifer Littler and droll master of ceremonies, David Burgess, Elaine Stabler and Maureen Weston. Accompanist was Ruth Birchall.